For example, electric companies base their calculation on wattage and price of per kilowatt. So why not test the items in your home and see how much your bills may be. In order to do this you will need a P3 Kill A Watt Electricity Load Meter and Monitor. These monitors are priced around $ 15 to $ 20 and you can find them online in stores like Newegg or Think Geek. This meter is a hand held device that you simply plug into the wall and then plug your appliance into it. The meter then does all of the work. You should base your calculations on a 24-hour period. Then read the amount of watts the appliances uses and see how much the electric company is changing you every day to use this appliance. For example, let’s say you plug your meter into the wall and then plug your stove into the meter. Now read the meter 24 hours from the time you plugged in it. Then take the charge the electric company charges you just to simply have the stove plugged in over night when no one is using it. The simple money saving solution is to unplug the stove when no one is using it. You will start to see the savings if you start doing this with every single electric product you have in your home. You can do this with TV, DVD’s Computers, and Microwaves. If you started unplugging these items based on your P3 Kill A Watt Meter, then you will start to see the savings. 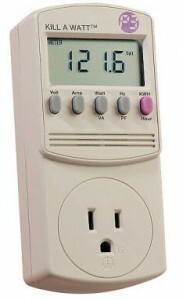 With the P3 Kill A Watt Electricity Load Meter and Monitor, you will have the following features, an easy to read LCD display that will show you all of the meter readings including, voltage, current, watts, frequency, power factor and VA. As the unit is plugged in you will start to see the KWH and the power duration time only after the power is on. The maximum voltage used is 125 VAC, the Max Current is 15 A, the meter also offers a 0.2% accuracy and you will see the cumulative kilowatt-hour monitor your electricity. Now that you see what the P3 meter does, how do others think it works? Most consumers who have tried it say that it worked perfectly. With times a bit rough, why not lower one of the bills that tend to be the highest. Invest in a P3 Electricity Load Meter and Monitor. It will really be one of the best investments you have ever made. You will start seeing the savings right away. It is well worth the price and the time you will spend collecting your data.